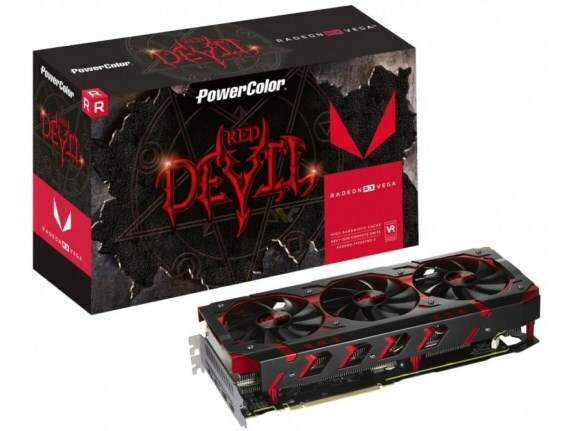 More details about the PowerColor Radeon RX Vega 64 Red Devil have hit the web. Webshop OCUK is taking pre-orders for £589.99 and reveals the clockspeeds of this model. The RX Vega 64 Red Devil features a triple-fan cooling solution and will reportedly have a 1417MHz base clockspeed (+13.6%), a 1607MHz Boost (+3.9%) and 8GB HBM2 clocked at 1890MHz. The card is supposed to be available in early December. PowerColor confirmed the clockspeeds but said the pricing is "complete nonsense". This is the fastest custom Vega seen to date, as it's the only one with a factory overclock, but the Boost is still lower clocked than the Liquid Edition from AMD which has a 1677MHz Boost.